Direct trauma to the hand or fingers is by far the highest cause of finger amputations; it is rarely as a result of disease. This is often work related injuries, but can also be as a result of recreational activities or hobbies, such as shooting or perhaps woodwork. 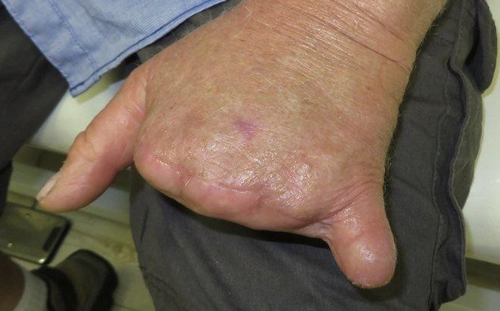 The level of amputation can of course be anywhere along the length of the finger, only the tip of the finger, half of the finger, or the entire finger lost at the base near the palm of the hand. Very high finger amputations such as the picture on the right hand side, makes it practically impossible to fit a prosthetic finger as there is no residual finger ‘’stump’’ over which to fit the prosthetic finger. Finger amputation of the front tip of the finger – at the distal interphalangeal joint level. Amputation of multiple fingers at mid-finger level – just below the proximal interphalangeal joint level. Complete amputation of multiple fingers – at the metacarpo-phalangeal joint level. Prosthetic fingers are made from silicone, with the finger nail generally made from different colour combinations of acrylic. Most prosthetic finger are simply suspended by means of suction created between the prosthesis and the residual finger stump. 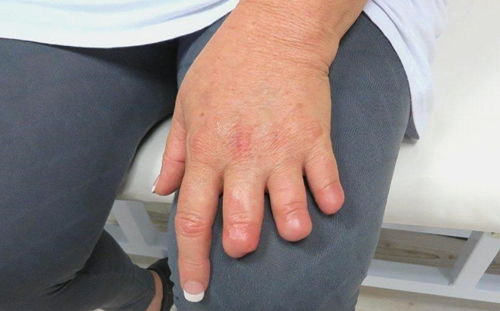 As the prosthesis is pushed onto the residual finger, all air is expelled between the silicone and the skin, which provides quite a secure and reliable suspension. Silicone prosthetic fingers with acrylic nails in a "French nail" finish. There is additional mechanical suspension of the prosthesis over the abutment extension, so less chance of it coming off, especially for quite high level finger amputation (short stump). There is improved function – as the prosthesis is internally supported by the direct skeletal attachment of the implant and abutment extension. More force can therefore be applied through the prosthetic finger to the object being handled. The top-end margins – where the prosthesis ends on the residual finger, can be made thinner as it is not required to provide suspension and stability to the prosthesis. This can improve cosmetic appearance as the margins can then potentially be less noticeable. Osseointegrated implant with exterior abutment extension. The abutment extension fits snugly into the core of the silicone finger prosthesis. The prosthesis in place on the residual finger. 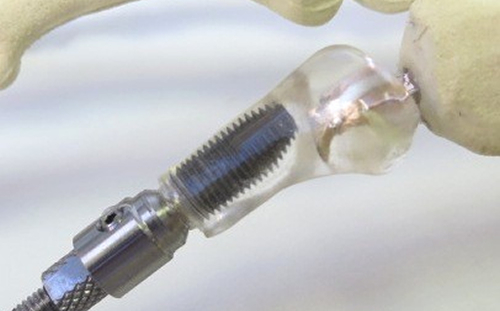 Osseointegrated implant, abutment extension and silicone finger prosthesis. 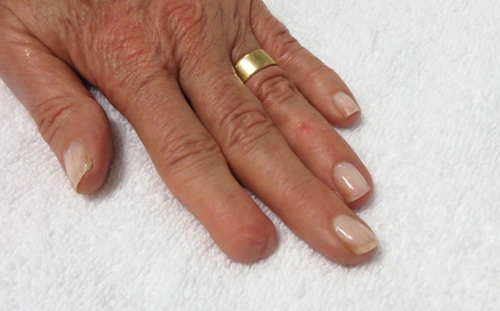 The threaded implant can be seen in the clear acrylic "bone" of the finger. 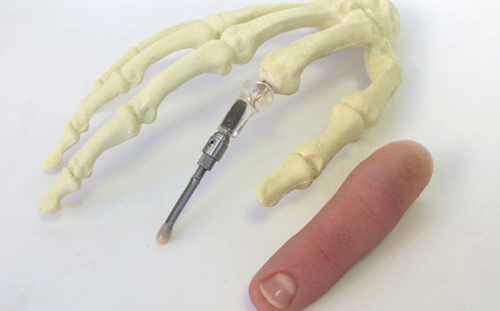 Irrespective of the method of suspension, the silicone prosthetic finger is primarily for comsetic purposes, but it can secondarily support functional use as demonstrated in the images below. It can also help to protect the residual finger end or tip, which is in many cases quite sensitive, especially when nocked on hard objects or surfaces. Silicone finger prostheses – provide basic functional support by allowing improved opposition grip between the amputated fingers and the thumb. Objects can therefore be gripped between the prosthetic fingers and the thumb.